On Sunday I took part in a wild food walk organised by Chichester Harbour Conservancy. It’s part of a program of events that they run throughout the year based around the harbour that range from art through to conservation and they are all pretty good value for money. This two hour walk was just £6 a head and was a lovely opportunity to get out and enjoy a sunny autumn afternoon. Theo was a little tired after a busy week of longer days at nursery, so I did miss out on some of the information as we were lagging behind the main group a little bit, but what I did manage to take in was fascinating. Along the shoreline we were introduced to sea spinach (growing above the high tide mark) several types of seaweed and samphire. The latter of which seems to be a very popular plant at the moment. As the walk progressed inland, we looked at berries, false nettles (which look perilous, but can be held painlessly) and discussed the many health benefits of rosehip syrup (apparently given to pregnant ladies during the war when there were no citrus fruits) and the folkore tales about our native plants. Sloe gin was of course given a mention and afterwards we all got a sample to taste. Having been fighting off a cold all week I have to say that the sloe gin worked absolute wonders for me, it tasted just like cough syrup (in a good way) and I woke up the next morning feeling human for the first time in ages. I’ll be making a new batch of it this weekend… just for medicinal purposes, obviously! One of Karen the courseleader’s recommendations was to make a recipe called Fruit Leather with hawthorn berries, blackberries and sloes.You boil them all up, sieve the fruit puree and then spread it thinly on a baking sheet and cook on a low temperature for 8 hours. The result is a bit like the dried fruit snacks you can buy for kids. 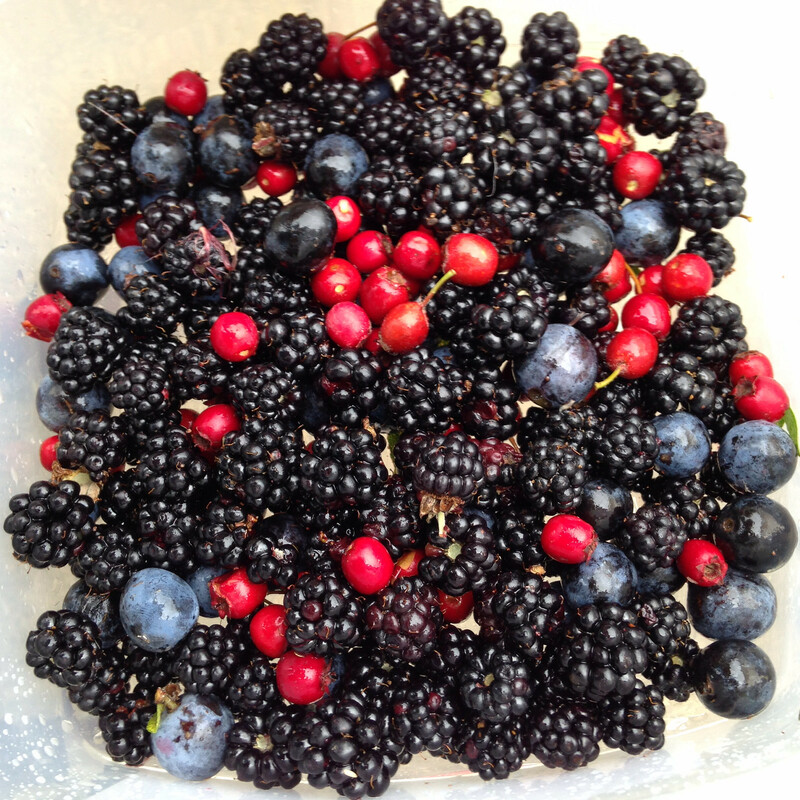 As we have all the relevant berries of these growing in the woodland next to our house we decided to have a forage this morning and see what we could collect. I did think we might be out of luck with blackberries, but we did ok and to bulk it out I added a couple of plums from the orchard just down the road. A whole saucepan full from within a few hundred yards of home! The fruit leather is cooking in the oven at the moment and I shall report back on the results at the end of the week. I love this post. Autumn is the best for foraging, there are so many delicious berries and fruits to find and the hot dry summer after a wet winter has done wonders for all the berries. I’d love to be able to recognise sea spinach, I’m going to google it now and do report back on your fruit basking, I’m dying to know how it turned out. Thank you for sharing with me on country Kids. That walk sounds like such a great idea. I’d love to find more wild food but apart from blackberries i’m just not 100% certain of my abilities to identify things! I wish Warwickshire did something similar! How did th fruit leather turn out? 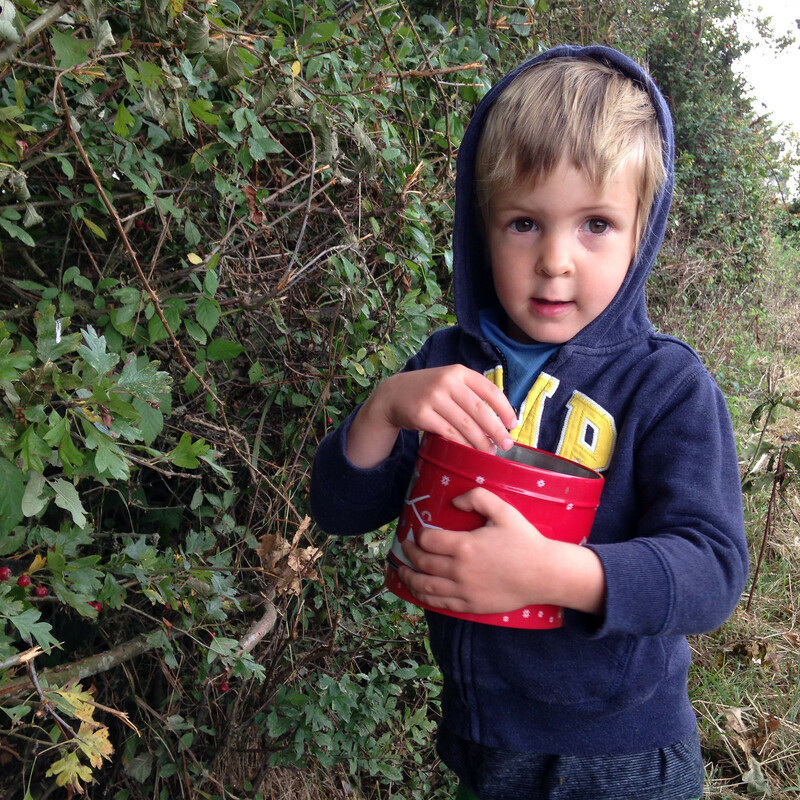 I didn’t know hawthorn berries were edible! I’m rubbish Linda, I totally forgot to update everyone!